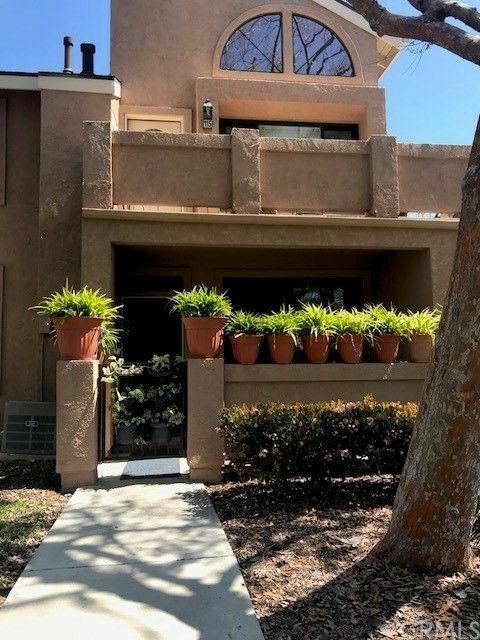 Desirable super clean 2br 2ba single level end unit in the popular Canyon Glen community with private fenced courtyard entrance and convenient guest parking. Direct access from your 1 car garage. Open and flowing floor plan with lots of windows creating plenty of natural light throughout. Inside laundry area with included oversized stackable washer and dryer. The kitchen has ample cabinet space, a large pantry, a built in wine fridge and high end appliances including an all electric stove and oven. Upgraded flooring throughout, two good size bathrooms and a master suite with double closets and plenty of room for a king size bed. The community offers 3 pools (heated) to choose from and lots of nice association amenities. Close to Schools, shopping, restaurants and entertainment. Nearby Santiago college is perfect for a family with college age students. New 6 panel raised doors, furnace is new as of 2012, and the wine fridge is newer too. This is a very Clean unit, truly in move in condition.